The Petaluma Farms Cutest Little Chick contest has been the high point of Butter & Egg Days for us since we moved to Petaluma. When I heard about the contest three years ago I had to enter my four month old son. It reminded me of the year my mom entered me and my brother in our hometown Fourth of July Pet Parade with our ill-behaved beagle mutt, Jingle. She terrorized the other animals and wouldn’t stay on our wagon float but it is still a great memory from my childhood. Petaluma’s Cutest Little Chick Contest doesn’t involve real animals, thankfully, but getting just one two year old to don feathers and walk on stage is harder than you might think. Over the past three years our costumes have progressed from felt feathers, to shopping bag feathers (the recycling theme), and finally to real feathers. Each year I assembled the costume with some trepidation, not knowing if my little diaper dictator would actually wear it. The first two years he was surprisingly cooperative but this year we were at a complete stalemate. He wouldn’t let me get near him with it. I had to measure his hat from one of his hoodies and sneak it on his head to get a final fitting. If he saw me coming he yelled “No!” and ran. He was intrigued by the feathers but wanted no part of wearing a feather covered onesie. “Blech, tickle, no!” he said with his tongue sticking out, again running. I even made him a little airplane out of airmail boxes to get him interested in the idea. 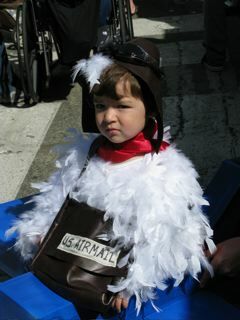 He loves airplanes so in honor of Petaluma’s Shining Moments he was supposed to be an aviator chick, commemorating Fred Wiseman’s first airmail flight from Petaluma to Santa Rosa in 1911. He liked the plane but still wasn’t going to have anything to do with the costume. I tried M&M bribery but no luck. So, on Saturday morning we headed down to the contest with little hope that he’d wear his costume and not even sure if it fit! This year’s contest had 72 contestants and we were registered as number 63. I had to go about this very carefully if I hoped to get him into the costume. Some strategic fawning over some of the other little chicks and I saw the wheels in his head start to turn. I tempted him with his airplane. Finally, in an uncertain voice, he agreed. But, I waited. Being number 63 out of 72 meant there was time. They try to get all of the kids to line up by number so the contest can move along smoothly but that really only works for the kids who aren’t walking yet. I waited until they were on contestant number 10 before I tried to dress him. My husband had the video camera going because he thought this was going to be the beginning of the end for the costume. But, miracle of miracles my son let me put it on!! He didn’t spit at the feathers. He didn’t run from the hat. He didn’t mind the scarf or mail satchel. Now, we just had forty more chicks to go before our turn. Oh no, did I dressed him too soon? Now that he was in chick mode he became quite eager to get up on stage. He made a break for the stairs several times. I tried to explain the concepts of ‘wait’ and ‘your turn’. Finally, when they were about ten contestants from our number we found our place in line. He kept trying to pull away. I pulled back. He was loosing patience with the hat so I held it in my hand. My husband stood ready with the airplane. Finally, it was our turn! I carried our chick. My husband handled the airplane. My son stared, bewildered by the clapping audience. I snuck the hat on his head. “Smile”, I said. “Waive”, I said. Then we were done. We barely managed to keep him in his costume until they announced the winners. He wanted to ride on the float but I knew that wasn’t happening. By the end he was ripping feathers out of his chest, trying to get the costume off. He was hot and he was done with being a chick. We didn’t win but I think every parent who has their child in this contest should feel like a winner. I know I felt pretty proud that we just made it to the stage. Thank you Petaluma Farms for 26 years of putting on the Cutest Little Chick Contest! Somebody needs to give you an award! How did he not win?!? That was a great idea and he looked super cute! There is always next year…. I agree, that kid is SUPER Cute! Good job. There is some tough competition! I don’t know how those judges decide. This year they were even doing some playbacks to make their final determination. It was the second largest turnout they’ve had for the contest.